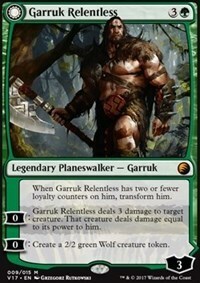 Card Text: When Garruk Relentless has two or fewer loyalty counters on him, transform him. : Garruk Relentless deals 3 damage to target creature. That creature deals damage equal to its power to him. : Create a 2/2 green Wolf creature token. 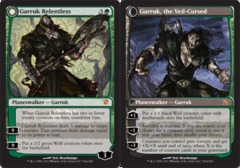 Garruk, the Veil-Cursed [+1]: Create a 1/1 black Wolf creature token with deathtouch. [-1]: Sacrifice a creature. 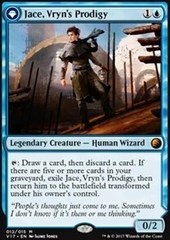 If you do, search your library for a creature card, reveal it, put it into your hand, then shuffle your library. [-3]: Creatures you control gain trample and get +X/+X until end of turn, where X is the number of creature cards in your graveyard.